This year’s Yeshiva University High Schools Annual Dinner Of Tribute, held on January 3rd, featured a STEM Fair, which provided an opportunity for both MTA and Central students to showcase their latest engineering innovations. 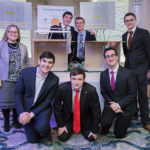 MTA Seniors Hanan Berger and Benny Jacob presented an electromagnetic robotic arm, created in their Scientific Engineering class, while Senior GJ Nieman exhibited the award-winning robots created by MTA’s two Robotics Teams. Seniors Noam Putterman and Dov Tuchman presented two projects that demonstrate the integration of engineering and Judaic Studies. As the entire yeshiva is learning Masechet Sukkah this year, talmidim developed these projects to bring what they learned in shiur to life in the STEM Lab. The first project, a wooden sukkah attached to a water sensor, releases a pulley-suspended tarp to protect the sukkah when the water sensor is activated. This unique mechanism was tested and validated by MTA and YU Rosh Yeshiva Rabbi Michael Taubes. The second project, a sukkah with a sliding wooden wall that adjusts the width of the sukkah itself and a laser pointer that shines light into the Sukkah at a chosen angle, focused specifically on the issue of sunlight and was created to help talmidim understand the following concept: According to the gemara, if a sukkah needs to be at least 4 amot wide by 20 amot long, a calculation based on simple trigonometry requires that the sun be approximately 78 degrees in the sky. However, in the Middle East during Sukkos the sun reaches only about 58 degrees. If a sukkah is meant to provide shade from the sun, how could a 4x4x20 amot sukkah be kosher if the sun will hit the schach? A possible answer was provided in a shiur given by 12th Grade Maggid Shiur Rabbi Tanchum Cohen, who used basic astronomy and a comment of Rabbi Aharon HaLevi (known as the Ra’ah), to provide his answer. According to the Ra’ah, the whole reason that a sukkah is kosher at night is because that sukkah is able to provide shade during the daytime. Using similar logic, a sukkah in Tishrei may not have the requisite sun angle, but during the summer months, when the earth tilts an extra 23.5 degrees, the sun indeed reaches above the 78 degree mark. Thus, because in the summer, this sukkah is able to provide shade, it becomes kosher during the late fall months. Talmidim used the model sukkah they built along with the laser pointer to imitate the various angles of the sun and see how they hit the sukkah at different points. These detailed concepts of Masechet Sukkah are sometimes difficult to comprehend. Using the STEM Lab and skills learned in Scientific Engineering class to create the actual scenarios discussed in the gemara, truly helped talmidim gain a deeper understanding of the masechet.